This quote is a famous text straight out of the bible. 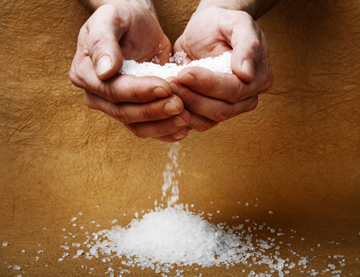 In biblical times all sacrificial offerings had to include salt. This was a covenant conceived between the Israelite’s and God. In today’s times the sacrificial salt offerings have reappeared in a huge margin in the sports industry where an athlete feels if he does not consume a certain amount of salt during an event he will become the sacrificial offering along route. The energy drink providers have certainly ingrained that into the minds of most athletes and today a covenant exists between sports drink manufacturer and athlete where salt is part of the parcel of their products. Any endurance sport newbie I bump into especially triathletes and ultra-marathoners the first bit of advice they seem to be given is to take salt tablets. As far as carbohydrate drinks go I often get questions on why has this drink only got 60mg’s of sodium yet another has 500mg’s of sodium and so the search for salt continues. Why is it that athletes feel the need to take salt? It’s quite simple they are all looking for that cure for cramping or prevention of cramping. No wants to land up in an event which they have prepared so hard for and then succumb to the dreaded muscle cramp which is debilitating, and often ends ones event. A few weeks ago I was watching Ironman Mont Tremblant, as one of our awesome athletes Liz Blatchford was doing her 2nd ever Ironman in hoping of qualifying for Kona which by the way she did in style. While watching the race another story was unfolding and that was of Luke Bell who came into T2 with three other well-known athletes Guillaume, Ambrose, Berger. The first 10km’s saw Bell losing time to Guillaume & Ambrose who were running at an incredible pace more like a 10km. He slowly began pulling back time and eventually landed up 1:25 ahead of them and then started to grow a nice gap on the run. Holding this pace would surely see him winning the North American Championship in style. Luke Bell is said to be the most talented Ironman athlete never to win an Ironman however he took his first win in May of this year at Ironman Australia. It was awesome to see him so comfortable at the front of the race looking for that 2nd victory and then the trouble started at the 20km mark. Suddenly Luke Bell stopped with a cramp in the leg. He tried to walk it off and then went into a stretch mode to release the cramp. He lost some time during this episode but then eventually carried on running and held a nice pace again. Kilometers later the same thing happened but this time the cramp was worse and he had to stop a little longer, stretching it out and walking a fair amount. In the meantime some top marathoners from behind were starting to gain momentum and slowly ate into Luke Bells gap. The cramps kept reoccurring and at one stage the stop and stretch took such a significant amount of time to release the muscle that even the crowd was beginning to wonder if he would be able to continue. In the end Luke Bell won the race and in a record time of 8:26:06, an incredible performance. He actually never panicked at all when cramping just handled it like a true professional and worked through it properly. The story above provides a lot of insight into cramping and we can learn from it. Where was Luke cramping? In his right leg. How did he release the cramp? By proper stretching technique and slowly getting back into a running rhythm. Was the cause of his cramping sodium depletion? Absolutely not. If an athlete cramps due to loss of electrolytes how would it be possible to stretch out the cramp and continue. Electrolytes don’t get recreated by stretching unless there is some new physiological breakthrough we have not yet been informed of. The other thing that is worth mentioning is why a single muscle would be targeted if when there is electrolyte depletion it occurs over the entire body. If an athlete had to tell me he was cramping all over from his hands down to his feet I would sit up and take notice. However any athlete I deal with mostly cramps in a localized area and this is certainly not due to sodium depletion as many tend to believe. It’s a fact that the main cause of cramping is due to an undertrained muscle. It does not mean you have not trained properly but it means you have pushed your muscles passed a threshold which you were comfortable with during your training. I have a simple example which I see all the time. An athlete does an Ironman distance race where usually his pace for a 180km ride would see him finish in say 6 hours, of course terrain and weather dependent. However all of a sudden in a particular race his pace is much higher than in training probably due to competition and ego. It can even be a time difference of 15 minutes faster which his legs are just not used to, and suddenly the dreaded cramps set in. In the particular example of the Ironman above Luke was pushed beyond his comfort zone by his two competitors at least in the first 10km’s he just could not keep their pace and he had work to do to catch them back. A good chance that the first 20km’s were harder on his legs than what he was expecting and that was also after a tough bike course which Mont Tremblant is known for. So muscle overuse was definitely a major factor in his cramping. It’s important to understand in any race of any nature what your body is capable of. If you don’t put it through the paces and train the muscles properly to cope with the intensity and time on them you can land up in trouble. I often hear athletes saying you must never race when you train. I cannot agree. If you you don’t do any race pacing when you train then how can you race? You need to train your muscles to cope at any given pace. Now let’s take a look at the electrolyte facts which have been scientifically demonstrated through experimentation and research. The first factual statement is that sweat itself is hypotonic. This simply means that you lose more fluid than sodium when sweating. In actual fact when you sweat your sodium levels become more concentrated triggering the mechanism of thirst. Drink some water dilute the concentration of sodium, thirst disappears and your body is happy. Your body is an incredibly finely balanced machine, it knows exactly what it needs and when, you just need to learn how to listen to it. In order for a person’s body to have a proper equilibrium the normal blood sodium level should be around 135 – 145 millimoles/liter (mmol/L). If a person’s sodium levels drop towards the 130 zone or under you are at severe risk of hyponatremia. This is actually quite common in endurance athletes and in common terms it’s what’s classified as over-hydration. Over-hydration has become quite common among athletes who drink not to thirst but who drink an amount per an hour because they have been told to in order to prevent dehydration. Any athlete trying to consume the exact amount of fluid that he is losing to sweat could be a contender in the over-hydration department. Let me make one thing clear, an athlete that dehydrates can still perform and at a very high level. You will find every elite athlete at the end of a marathon or ultra with fluid loss and slightly dehydrated, that is quite normal. However over consumption of liquid will see your demise and very quickly. It’s easy to resolve a dehydrated state by taking in fluid, but to get rid of fluid when you over drink in an event is not simple and the world of sport has seen a number of deaths related to hyponatremia. Another thing to take into account is that symptoms for dehydration and over-hydration can be similar and in certain cases athletes have mistaken the symptoms and then over consumed liquid to try to reverse the situation they thought they were in. This only made matters worse and put them into a dangerous situation. So what does a sports drink that contain fairly high levels of sodium do for me? Actually it does not do much. The carbohydrates play a role in provisioning energy and helping maximize the absorption rate of the fluid ingested. The sodium simply makes you drink more and will slightly help increase the absorption rate. It will cause that thirst mechanism to be unnatural and remain there for a long period of time causing you to drink more because you think you are thirsty. A sports drink that has a nice high sodium content will surely prevent dehydration, BUT you still run the risk of over-hydration. Actually more so than just drinking plain water because with drinking water your thirst trigger is accurate, but with salt thrown into the equation it now tricks you and this needs to be monitored carefully. I always recommend a drink with a lower sodium content for an athlete which makes it easier to manage their fluid intake more naturally. The next question I get asked is surely if I consume sodium in a drink, my sodium levels rise substantially in order to justify additional fluid intake? The answer to that is no. The differential is actually so insignificant it won’t play a role at all. I did a lot research on the matter a few years ago and two sports scientists I have a lot of respect for are Professor Tim Noakes and Dr Ross Tucker. Professor Noakes has published a book called Waterlogged which is an incredible read for anyone that is fascinated by the subject of hydration. Dr Tucker did extensive research on the causes of cramping, which was documented in 2007 and you can gain a lot of insight at the following link at his “The Science of Sport” website. Over and above my own studying and research into the subject I have worked with many athletes over the past few years and seen their ability to perform while managing fluid intake properly, including myself. Another issue which sometimes causes athletes to over-drink is heat. It happens often where an athlete will attempt to cool down their body by drinking fluid, especially if it’s cold fluid. Unfortunately this does not work well at all. You not really cooling down your core temperature and you are in a situation where over consumption of liquid can occur. The most efficient way to cool down your core temperature is to actually get cold water or liquid into the lower abdomen or groin area (a future blog ;-)). Throwing over one’s head is not as effective but it’s still better than consuming liquid in an attempt to stay cool. Another fact I want to mention is that of course training in cool conditions will get your body used to fluid loss under those cool conditions. Suddenly moving to a much hotter more humid climate will of course put you under far more stress during exercise. Fluid loss will increase and you will need to manage it a lot more carefully. Its always good to acclimatize and mimic training conditions to predicted race conditions. I actually have a training partner who when he races in the overseas summer while he is training in our winter does a number of indoor treadmill and bike sessions with heating in the room in order to ready the body for temperature changes. In conclusion I would like to mention that each and every person is unique in the amount of liquid they require for proper hydration and electrolyte balance. Some athletes can run 30km’s without any water while others cannot go more than 10km’s without a drink. This comes down to getting to know your body and understanding how much fluid consumption is perfect for you. It will of course vary under different conditions as weather will determine our fluid loss in the form of sweat. The only accurate trigger that we have and it’s a brilliant tool that we are born with is called thirst and if we listen to it properly we cannot go wrong. Remember that water is best or a low sodium drink if you really want your thirst trigger to be hitting the bull’s eye constantly. Lastly the next time your friend suggests he has a cure for cramping please do me a favour and turn to him and just say, yeah we know “just train properly”. HI Mark, interesting post. I have a question please. If I am outdoors hiking all day on a hike that is intermediate in difficulty and it’s moderately to v warm I get such a bad headache by the end of the day. I think it’s because I perspire a lot. Does not matter how much water I drink, I will still get a bad headache if I am at it for too long. I cant seem to replace the water I am losing just by drinking water. Hi Mark, interesting read thanks, I have a question regarding all this “cramp block/cramp stop” they sell this based on replacing minerals lost in exercise to combat cramping. Why do people take this if your theory is correct (which i for that matter believe is right, not enough conditioning)? Another product I like is hammer, they sell a endurolyte product, do you have any thoughts on it and lastly what 32Gi product would you recommend for every day mt bike racing as well as a hammer equivalent? Fascinating. Just interested to understand your view on coconut water? In oz its all the rage for electrolyte replenishment during running and endurance events. HI Mark thanks so much for the very informative reply. I think in general I struggle to hydrate. I drink mostly water ( other than fruit / veg juices and soups) but I don’t feel like I retain much of it. If I drink 1/2 liter I go to the bathroom a lot. I sometimes think I drink too much at one go and that ‘s why its not absorbed, maybe i should take smaller sips? What kind of compound do u suggest I add to my water – rehydrate ? I haven’t had a look if it contains all those ingredients you mentioned. Re my salt intake – I do eat mostly natural but I also think I get in salt when I do buy lunches at health places. I am sure they add salts.